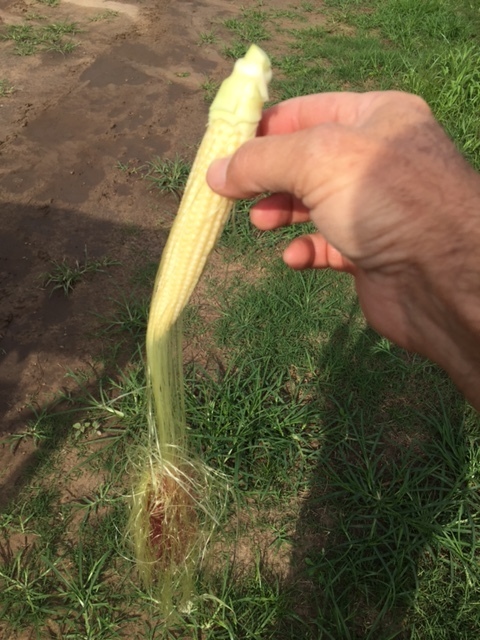 Corn planted a week ago (Feb. 27th) is doing pretty well. A pretty hard crust developed midweek in some fields and we thought we’d have to water it but the good timely rain came Thursday night. 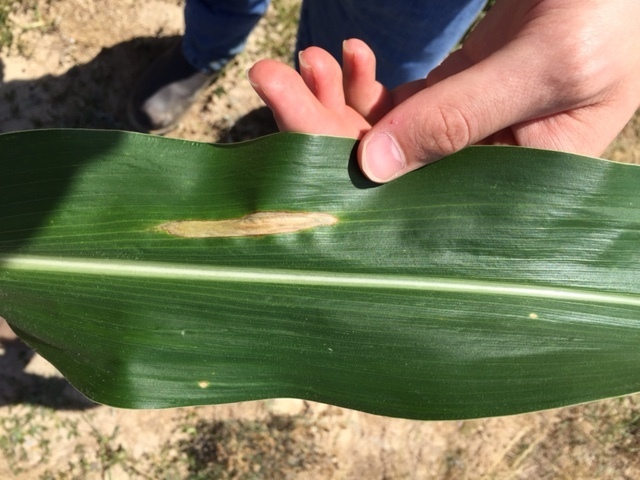 There is still danger of future frosts causing damage to this early planted corn but spreading out risk is usually a very good idea. There was some concern as we had 2 hard frosts last Saturday and Sunday mornings. Soils never did cool that much however, thankfully. Here’s the average daily soil temperatures at the 2 inch level for this last week at the Donalsonville Weather Station. This next week should be just right for corn planting with less chance of future cold damage on it and warmer soil temperatures for quick emergence. When it dries off enough to plant. We will be having our Field Corn production meeting early this year. We will have it on Wednesday, Dec 2 at Noon at the Lions Hall in Donalsonville. 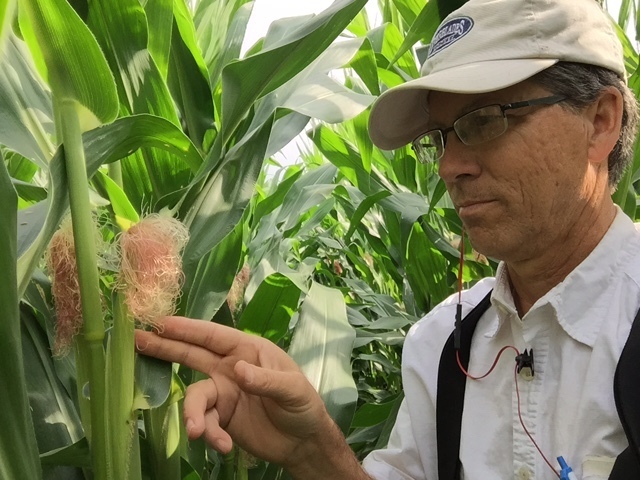 Dr. Dewey Lee and Dr. Eric Prostko, UGA Extension Scientists, will be here to talk about Corn production and weed management. We look forward to seeing you there. 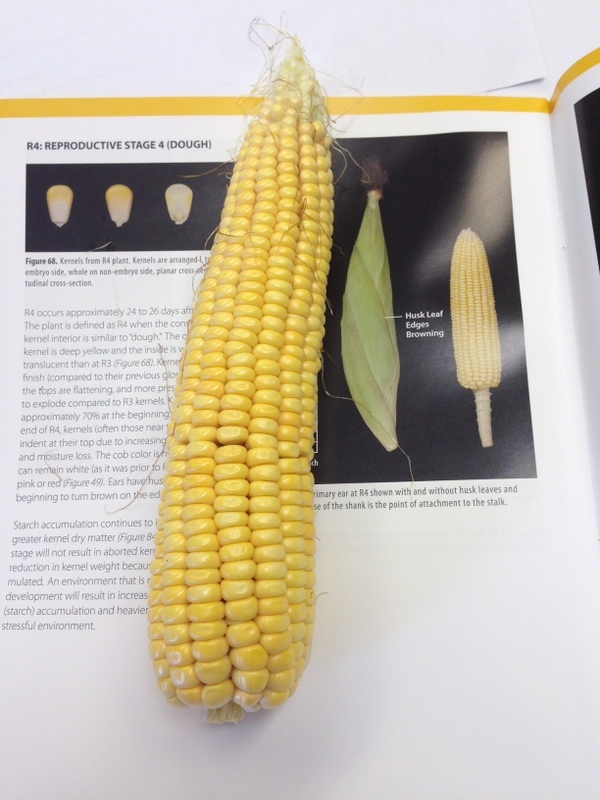 The 2015 Corn production Guide can be accessed here. Here’s an excerpt from it. 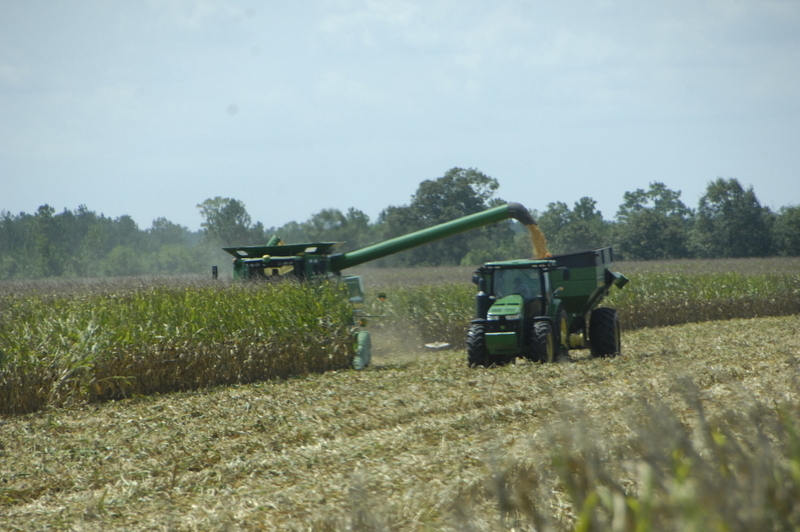 Corn production in Georgia has remained relatively steady in the past decade due to limited opportunities for profit and increased risks from higher production costs. Corn acreage in the 1970s averaged 1.64 million acres in Georgia, however, it declined almost 50 per cent in the 1980s to 0.86 million acres due to poor prices and extended periods of drought and further still during the 1990’s. Since then, acreage has stabilized averaging 380,000 acres in recent years. 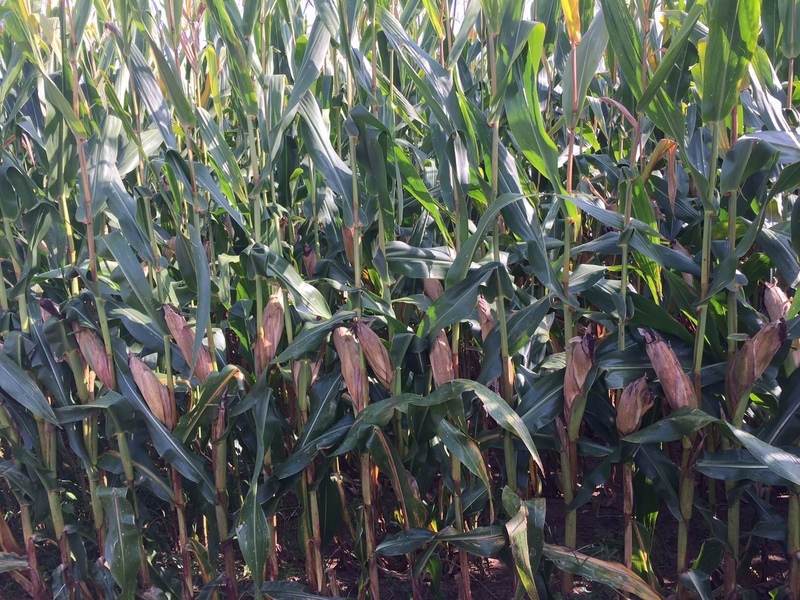 It is predicted that acreage will drop slightly in 2015 from 2014 due to lower corn prices and increasing cost of inputs. 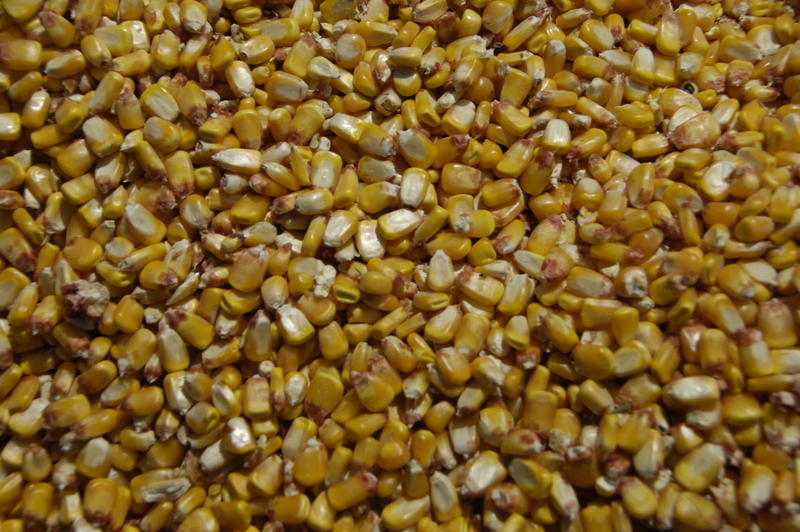 Plant corn as soon as temperature and moisture become favorable for seed germination and seedling growth. Soil temperature in the seed zone should be 55 F or greater before planting. 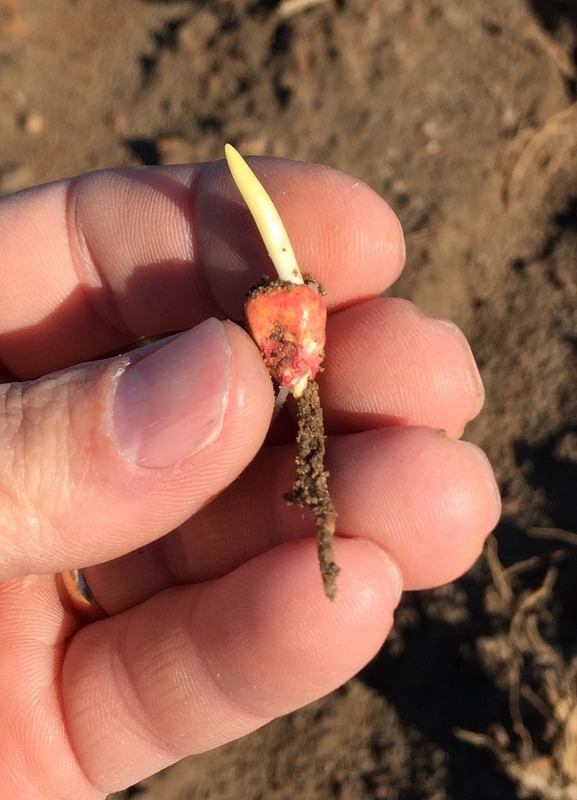 Corn seed will sprout slowly at 55 F while germination is prompt at 60 F. Delay planting if cold weather drops soil temperatures below 55 F at the two-inch level. However, if soil temperatures are 55 F and higher, and projections are for a warming trend, corn planting should proceed. 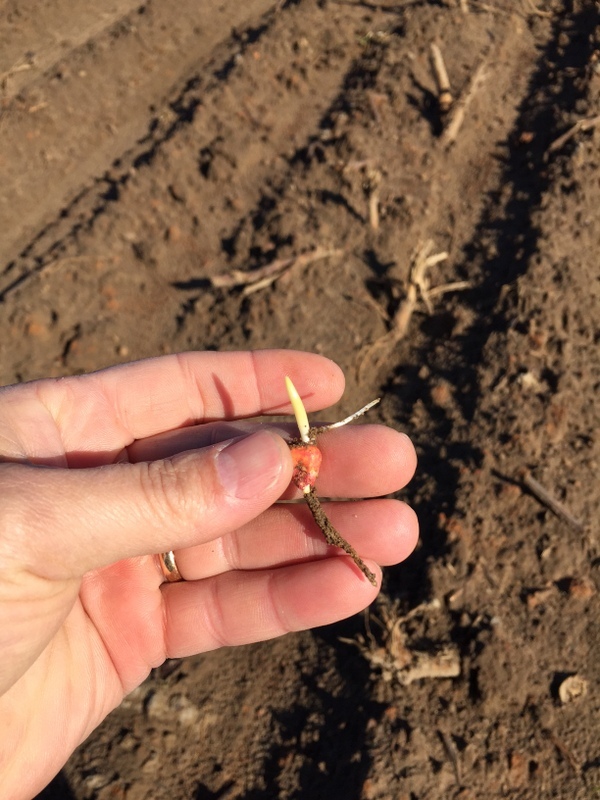 Extremely early planting introduces a risk to frost or freeze damage and subsequent loss of stands, however, producers yields are greatest with early planting. Usually, as long as the growing point is below ground level, corn can withstand a severe frost or freezing damage without yield reduction. It is best therefore to monitor soil conditions and weather if your desire is to plant as early as possible. Generally it takes corn seed 7 to 12 days to emerge when planted in soils there are 55 F. Early planted corn out-yields late planted corn. 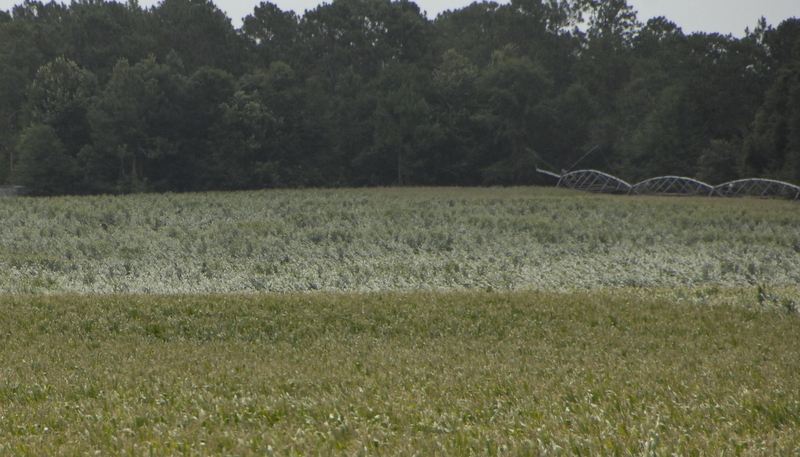 Depending on your location, planting dates may range from early March in south Georgia to mid-May in north Georgia. 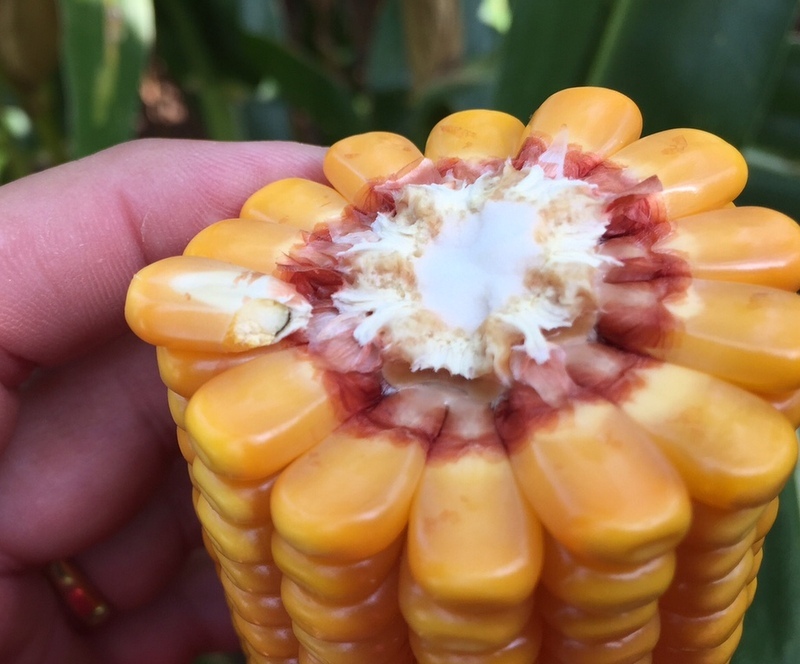 Early planting helps avoid periods of low rainfall and excessive heat during pollination, both of which lead to internal water stress during critical periods of corn development. 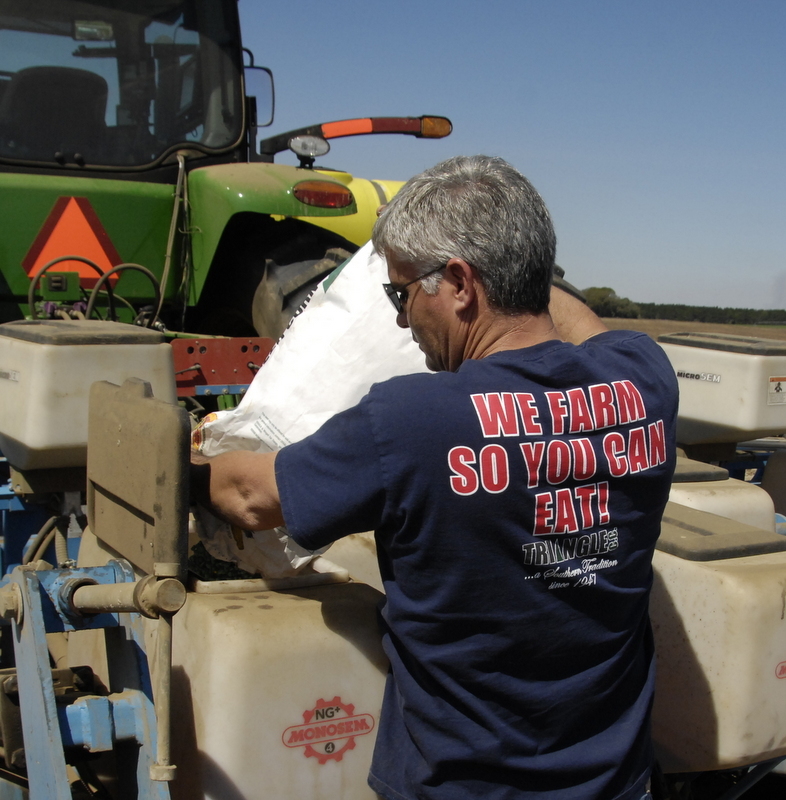 Early planting is essential when double cropping soybeans, grain sorghum, millet or vegetables following irrigated corn. 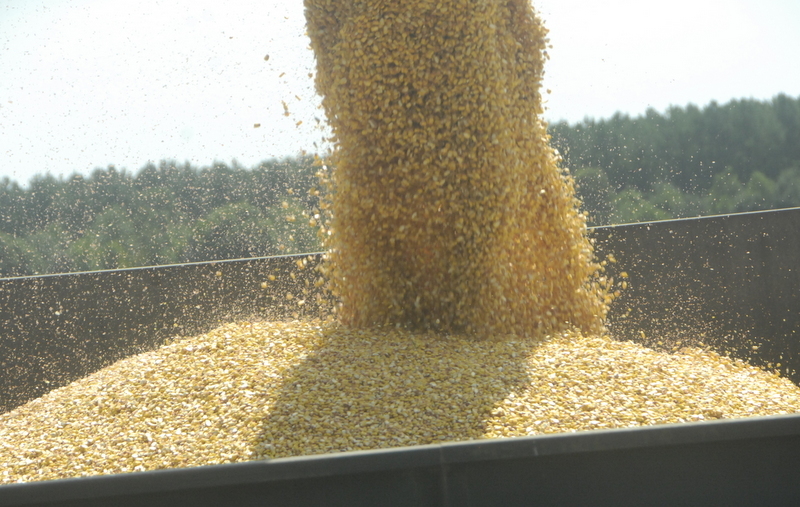 As planting is delayed into the summer, corn yields decline. 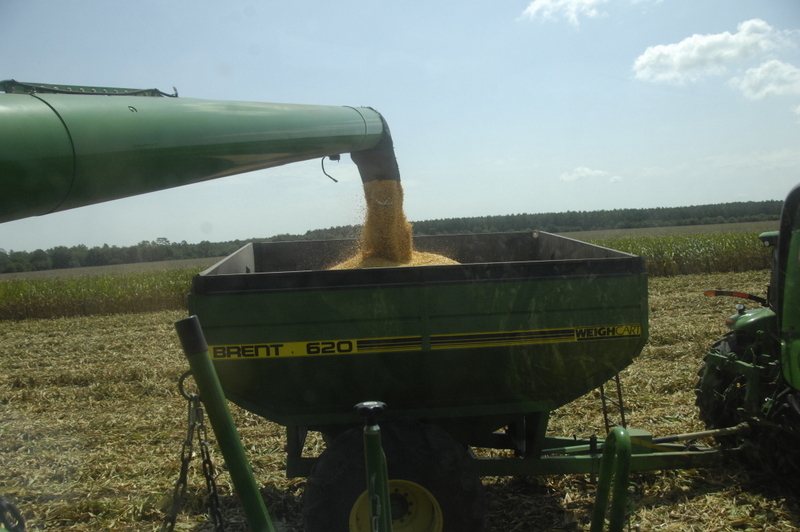 In general, yields decline at ¾ a bushel per day rising to about 2.5 bushels per day. 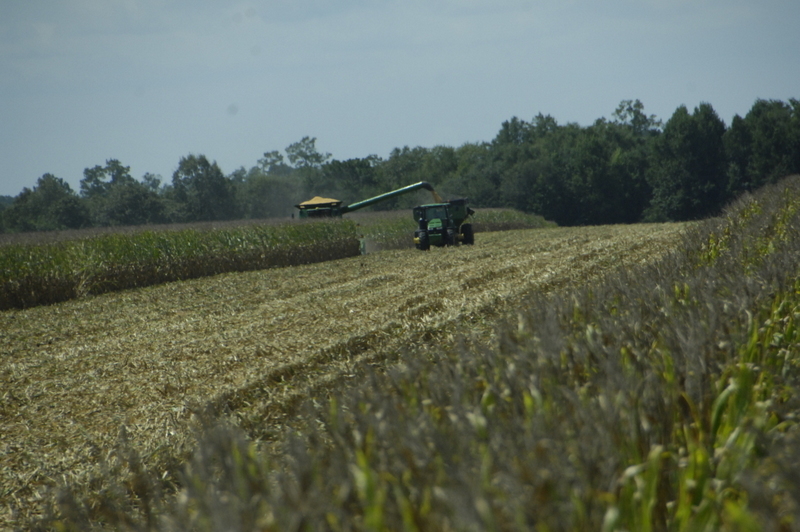 Corn Harvest is going on this week in several fields. 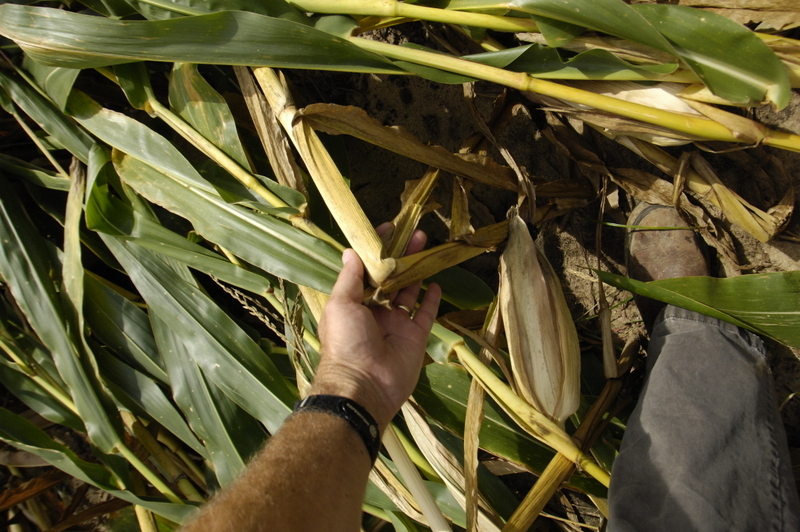 Rain has slowed harvest in some areas, but its needed on other crops. I’m surprised the moisture is so low for this time of year, 25 to 23%, I even heard a 21% grain moisture. Grain quality looks very good. Yields are good. I’ve heard of 258 to 274 to 280 yields over large areas of 3 different fields. 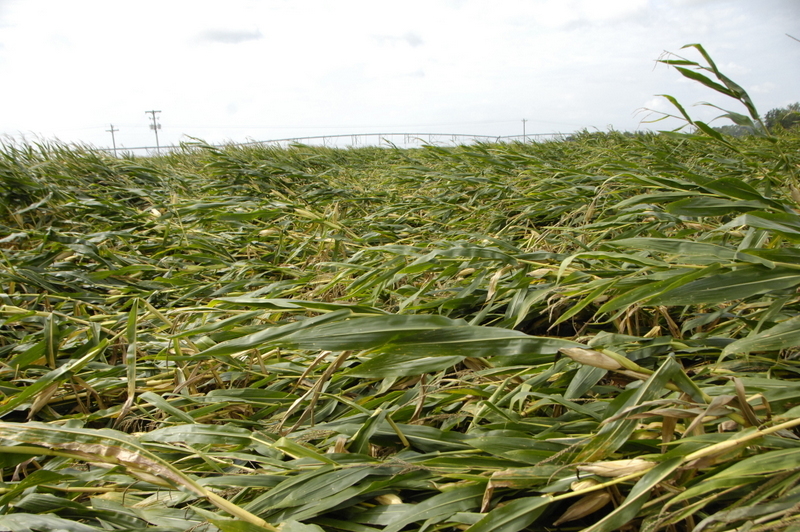 We are seeing some corn falling in areas due to weather so we need to get it out as we can. Some soybeans have been planted already behind corn harvest, as soon as the combine gets out of the way. 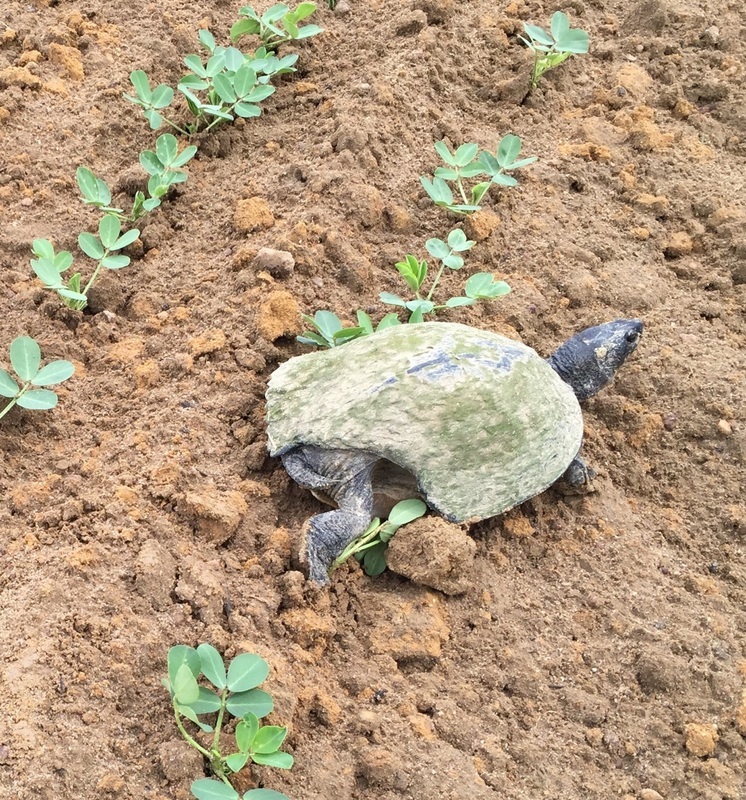 That’s good as these will have more time to grow and produce beans. I’ve had some questions about if soybeans planted like this, when peanuts are in the rotation, if it hurts peanut yields in the future. We’ve not really seen that happen. 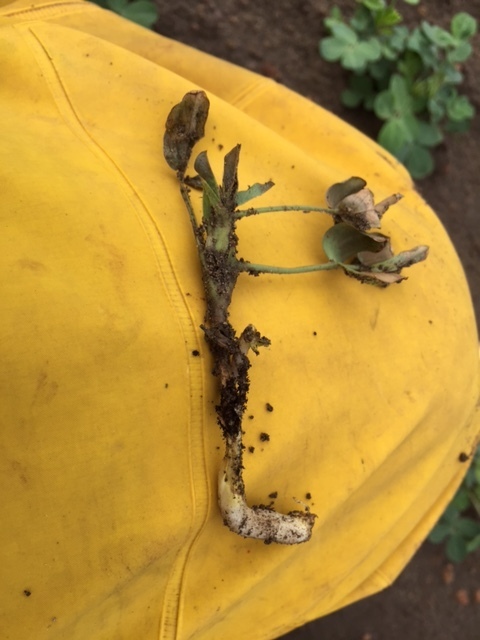 Growers are aware that soybeans could cause problems in a peanut rotation and are careful to use good soilborne disease chemistry on the peanuts and also to use nematicides if needed. Some of the best , high yielding peanut growers we have also grow some ultra late soybeans after corn. 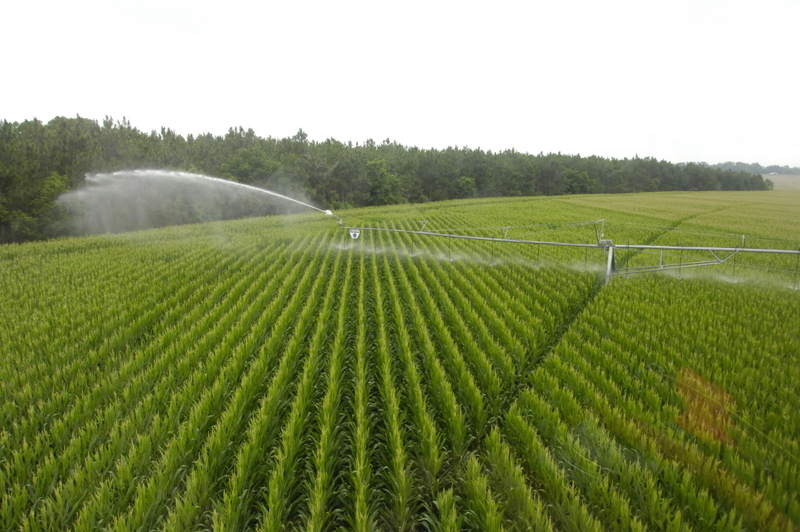 It’s a happy day when your corn black layers and you can cut the irrigation off. 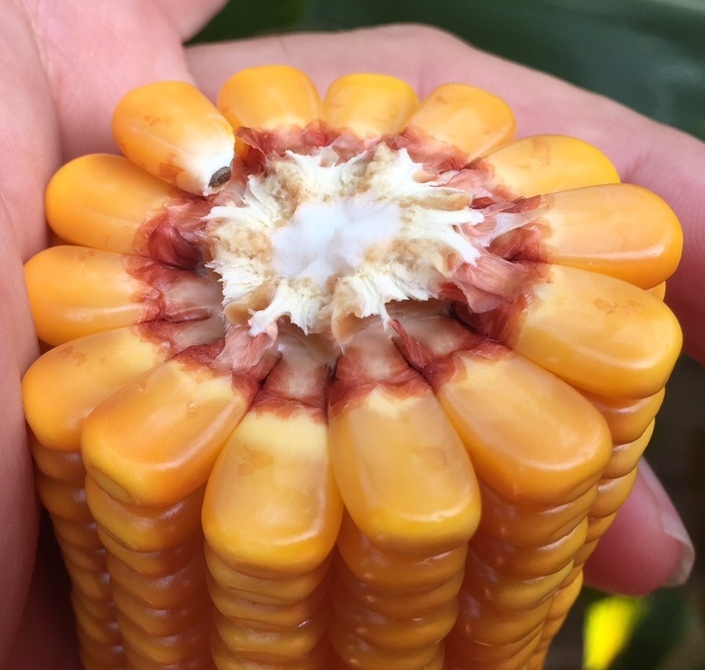 Many of our oldest corn fields have matured and the black layer has formed at the base of the kernels so they have cut themselves off from receiving any more photosynthate from the plant so it’s made. Folks are cleaning up the combines and cleaning out the grain bins and getting grain dryers ready. 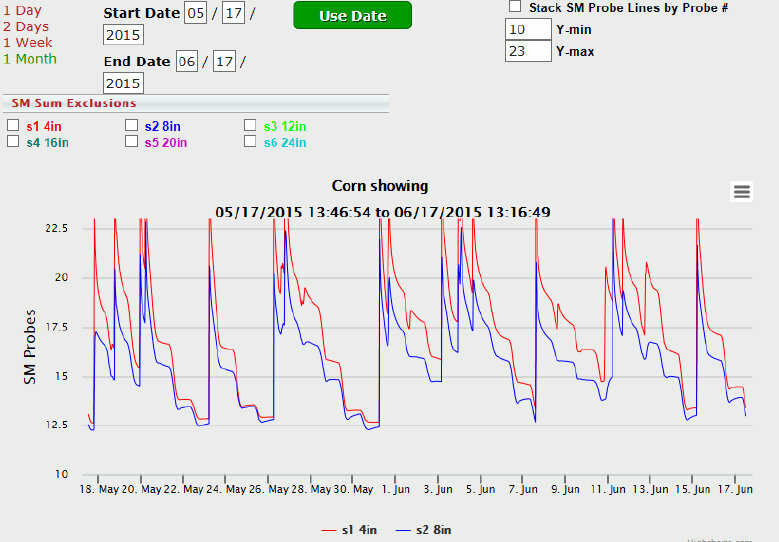 Several folks are talking about starting combining corn early next week. 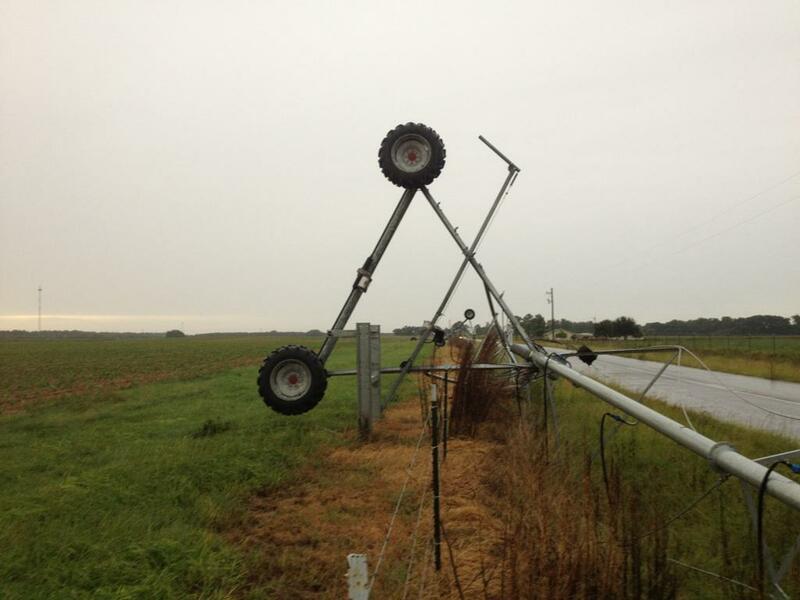 We had some high winds or tornadic activity in Southern Seminole and Decatur Counties this week. 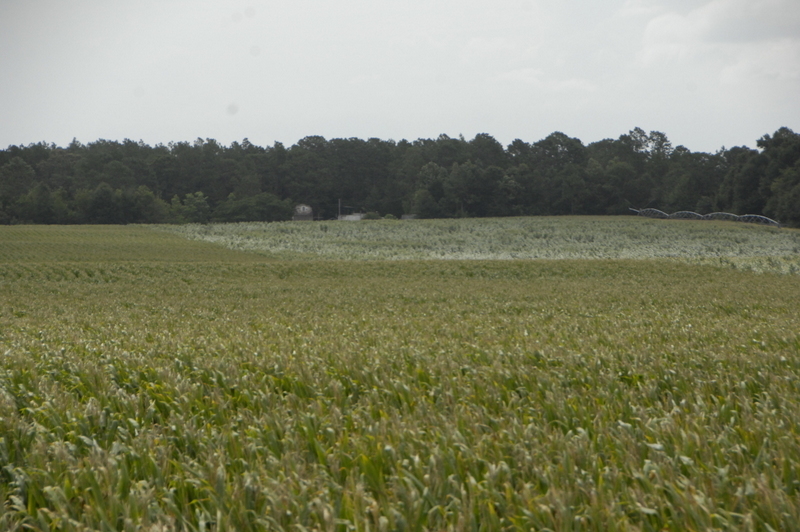 Here we see a couple of corn fields that were partially flattened. They were about a week from being made, a week from black layer. 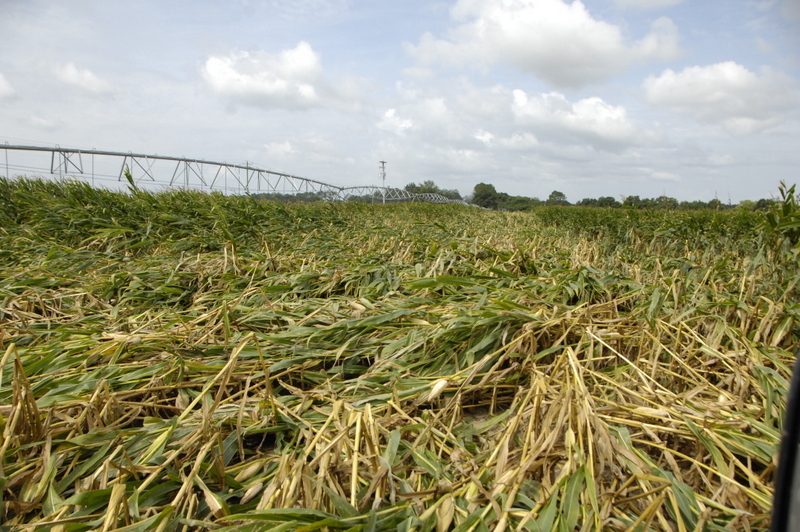 This is very unfortunate because now harvest will be very difficult here and much corn will be lost. Fortunately it was not too widespread. Some hybrids were affected worse than others. 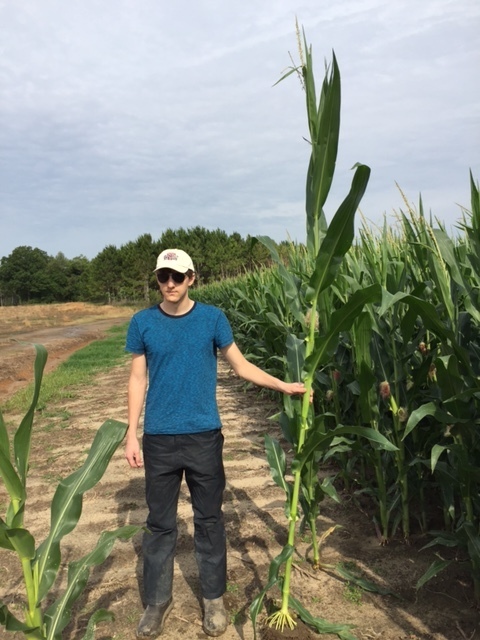 This is part of a hybrid test plot we had at the Mims farm, in Reynoldsville. 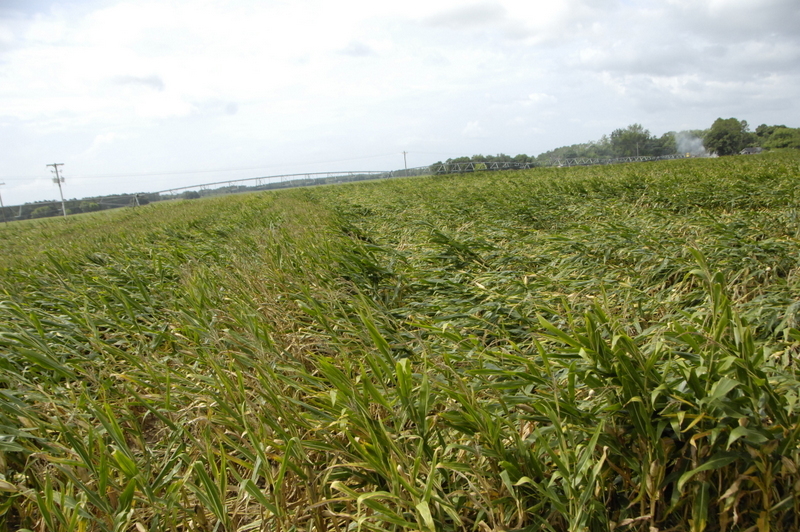 At least one pivot was also overturned, and several trees, shelters, barns and some porches were affected. 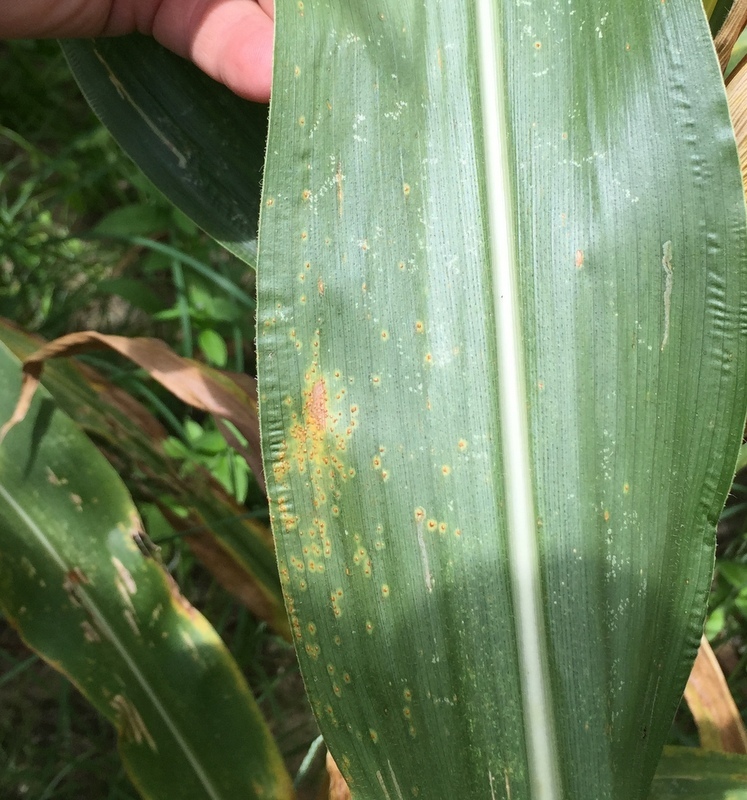 Here is some Southern Corn Rust I saw this week here in Seminole County. 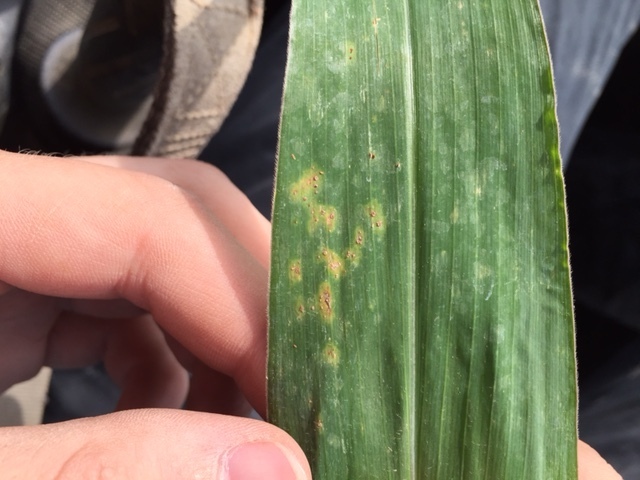 I have been pleasantly surprised at how slowly southern rust has spread. In other words, it has not exploded this year as it has in some years. Even in this field it was spotty around, not a lot anywhere. 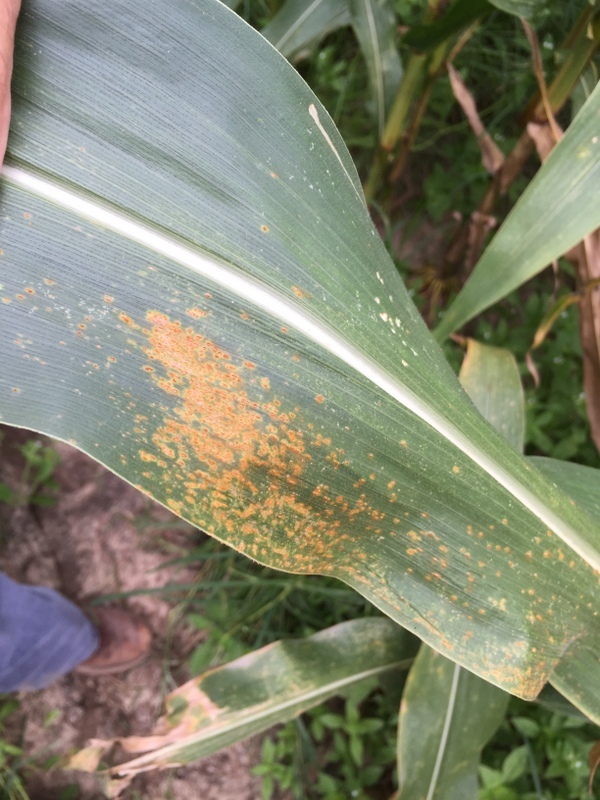 Part of the reason may be that most everyone protected their crop from the disease pretty well. Here’s a list of the 2015 DuPont Pioneer field days. These events will be fast-paced and informative. They will discuss new, hybrids, as well as the latest seed technologies for grain and silage production. Please choose a field day near you. A meal will be provided at each location. Meet at Fellowship Baptist Church at 2861 Spring Creek Rd.